There were live camels, trapeze artists, a 12-minute fireworks display and an enormous birthday cake carved in the shape of a Chinese temple. Blackstone boss Stephen Schwarzman’s 70th-birthday party, hosted at his Palm Beach mansion in February, drew dozens of high-profile guests including Treasury Secretary Steven Mnuchin, art dealer Larry Gagosian and billionaire businessman David Koch. Many of them cheered as Gwen Stefani crooned “Happy Birthday” at the end of the night. Schwarzman, of course, ranks as one of private equity and real estate’s wealthiest players, having earned $425 million last year from his salary and dividends tied to his ownership stake in Blackstone. His net worth is now pegged at $12.4 billion, according to Forbes. And he’s not alone in wanting to live the high life. Whether it’s yachts, planes and horses or Schwarzman-style entertainment and off-the-wall hobbies, many of real estate’s heaviest hitters take pride in their expensive pursuits outside of acquisitions and development. And with the last financial crisis nearly 10 years in the rear-view, as the stock market hovers at record highs, many New York property moguls are seeing little reason to enjoy life under the radar — despite softening real estate values. In some ways, property titans are leading that push. Roughly 4.3 percent of the world’s ultrahigh-net-worth individuals (categorized as people with investable assets of $30 million or more) made their money in real estate, according to Wealth-X. Those industry players have an average net worth of $193 million, while the top 30 have a combined net worth of $240 billion. 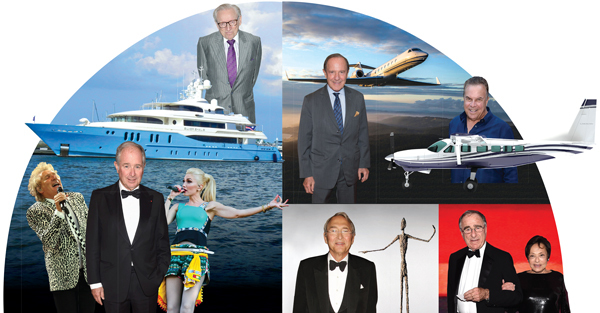 From Harry Macklowe’s alleged $1 billion art collection to David Levinson’s stake in the Yankees, The Real Deal delved into some of the most extravagant hobbies of real estate’s A-list. Island Capital Group chief Andrew Farkas may know as much about superyachts as he does about real estate securities. The billionaire executive has controlled marinas in some of the toniest Caribbean destinations — including St. Thomas and St. Maarten — since he launched his firm’s subsidiary Island Global Yachting in 2005. The idea for the marina business stemmed from his own passion for the sea: As an avid yachtsman, he reportedly found that it was troublesome to find docks big enough for boats of up to 450 feet. It’s a hobby that comes at a significant cost. In addition to the colossal price tags — the most expensive superyachts run up to $500 million — owners pay an estimated 10 percent of a boat’s initial price each year to keep it running, including millions in fuel, maintenance, repairs and crew salaries. The insurance company Towergate pegs average annual dockage fees at $350,000 and insurance at $240,000, which means owning a dock and renting it out to fellow bigwigs can be a profitable endeavor. Still, Farkas isn’t the only real estate executive with a penchant for high-end boats. Other yacht owners in the real estate industry include developers Nathan Berman and Larry Silverstein. Silverstein owns a 180-foot yacht called Silver Shalis, named after his daughters Sharon and Lisa. 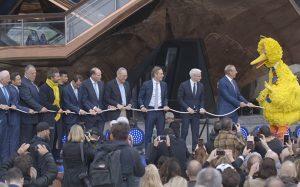 The World Trade Center developer has docked the ship at Indian Harbor Yacht Club in Greenwich, Connecticut, and in Antibes in the South of France. About 15 percent of ultrahigh-net-worth individuals use private planes for the bulk of their flights, per an international wealth report compiled by the London-based real estate services firm Knight Frank. That includes a handful of prominent real estate players, including President Donald Trump and developers Jeff Greene, Kevin Maloney and Mort Zuckerman. Zuckerman, co-founder and chairman of Boston Properties, reportedly owns a $60 million Gulfstream G550, a business jet that costs about $5,000 an hour to operate, according to the Aircraft Owners and Pilots Association. Maloney, founder of the development firm Property Markets Group, even flies his high-speed jet turbine himself — usually to and from his office in Florida. Maloney told TRD in 2014 that he got into flying, ironically, because of his fear of flying. Greene told TRD several years ago that traveling in his Cessna Caravan seaplane — which he houses in the Hamptons — dramatically cuts his commute from the East End to Manhattan. It takes just 35 minutes by air, Greene noted, and he lands the more than $2 million Cessna on the bay right outside his Sag Harbor compound. He said he was inspired to purchase the plane after seeing the singer Jimmy Buffett landing his plane on the same stretch of water. In the ongoing divorce battle between 432 Park Avenue developer Harry Macklowe and his estranged wife, Linda, no asset seems to have gained quite as much attention as their reported $1 billion art collection. 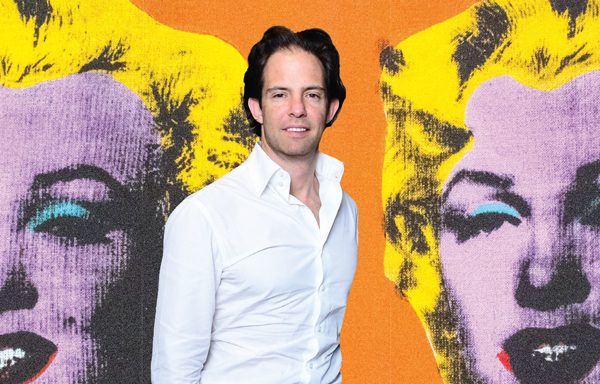 Macklowe claims he paid for every single piece in the collection — which includes works by Mark Rothko, Franz Kline and Gerhard Richter — and should therefore be the one to hold on to it. Indeed, nothing seems to go hand in hand with real estate quite like art, which can often be used as business collateral. Among the New York real estate crowd, Sheldon Solow is widely said to have the most significant collection of postwar art. And most of the pieces were purchased decades ago, which means he makes a hefty profit every time he sells one. In 2015, Solow sold a bronze Alberto Giacometti sculpture titled “The Pointing Man” for $126 million. Developer Edward Minskoff, whose mother was a sculptor, has a collection of more than 500 pieces, including a 6,600-pound Jeff Koons sculpture of a red rabbit, which he exhibits at his 51 Astor Place office building. A 12,000-pound sculpture from his collection by Isamu Noguchi was installed in Hudson Square near the Holland Tunnel last December. But for a few in the business, collecting has become a hefty legal burden. Broker-turned-developer Michael Shvo was indicted on tax evasion charges related to his extensive art collection in September 2016 and still faces up to a year in prison. He was charged with scheming to evade payment of more than $1 million in taxes related to purchases of fine art, furniture, jewelry and a Ferrari, the indictment from the Manhattan district attorney’s office shows. Michael Shvo was hit last year with tax evasion charges tied to his art collection, jewelry and a Ferrari. His art collection includes pieces from Andy Warhol, Alexander Calder, Jean-Michel Basquiat, Frank Stella and Francois-Xavier Lalanne, whose sheep sculptures dot Shvo’s Time Warner Center apartment. Likewise, Aby Rosen of RFR Holding had to pay $7 million last year to settle a case brought by the New York attorney general, who alleged he’d failed to pay taxes on $80 million in artwork that he had bought or commissioned between 2002 and 2016. Others in the real estate world said they’re more content with wine than an expensive art collection. One of the riskiest hobbies for those who specialize in glass-and-steel towers and concrete numbers may be acquiring a stake in a professional sports team. While athletes often make millions, the sports business can lead to brutal financial losses on the ownership side, and many investors struggle to break even. But real estate scion Jed Walentas, who heads Two Trees Management, seems to have picked a clear winner. Walentas recently described being a part owner of the San Francisco Giants as “fantasy camp” — the team has won three World Series titles since he purchased a stake 10 years ago. With a $2.25 billion valuation, Forbes ranked the Giants as the third most valuable franchise in Major League Baseball in 2016. Other team owners in New York real estate include the likes of Jonathan Tisch, co-chairman of the board of Loews Corporation, whose family owns the New York Giants, and L&L Holding’s David Levinson, who owns a stake in the New York Yankees. While the Kushners have notoriously flirted with buying a professional baseball team on more than one occasion — the Los Angeles Dodgers in 2012 and the Miami Marlins in 2017— no deals ever came to fruition. Until the start of the decade, Daun Paris and her husband, Peter Hauspurg, the founders of Eastern Consolidated, raised llamas on a farm in Bedford, New York. But they sold the property to Newmark Knight Frank’s Barry Gosin for $9.4 million in 2010 after their kids went off to college. These days, Paris said, she makes her own 22-carat gold jewelry and even invested in building out an equipped studio in her apartment after taking classes from a jewelry pro a few years ago. New York real estate mogul Alex Sapir, meanwhile, spends some of his free time performing at nightclubs as an electronic dance music DJ. Billionaire Gristedes Foods owner and Red Apple Group Chairman John Catsimatidis is a gun enthusiast — he once captured one of three robbers who tried to hold up one of his grocery stores, on 84th Street and York Avenue — while Eric Trump and Donald Trump Jr. enjoy big-game hunting in Africa, a pastime that has sparked outrage on social media on multiple occasions. On top of the travel expenses, Fisher also had to invest in preparations. He hired Jimmy Riccitello, an Ironman cycling official, to put him through his paces. “[I’m] not winging it,” he quipped. But when it comes to extravagance, Miami-based developer Gil Dezer, the son of Israeli-American real estate tycoon Michael Dezer, takes personal spending to new levels. His private Porsche collection — apart from the more than 1,200 cars he and his father keep in their Miami Auto Museum — is reportedly worth millions, and each car is painted a signature shade of silver. His most expensive ride is a $1.5 million Bugatti Veyron, one of just 450 ever made. 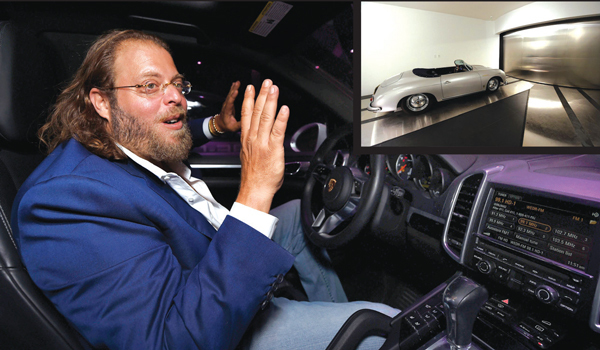 Miami developer Gil Dezer driving one of his many cars into in his condo in the Porsche Design Tower. Dezer’s 60-story Porsche Design Tower in Miami even includes an auto elevator, known as “the Dezervator,” which allows him to park his vehicle inside his condo. Dezer also reportedly owns a $17 million Gulfstream IV private jet, which he retrofitted with seats similar to those in his Ferrari 458 Italia for $55,000 apiece, he told CNBC last year. SL Green Realty CEO Marc Holliday is an avid horse racer and has scored millions with his gray filly named Love Train. His Blue Devil Racing Stable in Scarsdale — named after his high school lacrosse team — focuses on breeding and raising racehorses. He and his wife also support Akindale Farm, a rescue and retirement destination for horses in Pawling, New York. Newmark Knight Frank’s Jeff Gural is also a major presence in the racing world. The real estate mogul, who owns the Meadowlands Racetrack as well as Tioga Downs and Vernon Downs upstate, told TRD in 2012 that his passion for the sport goes all the way back to his childhood. Gural recently declared that he would begin out-of-competition testing for cobalt — an alleged performance enhancer for horses — and has banned some trainers from racing at his three Standardbred tracks. 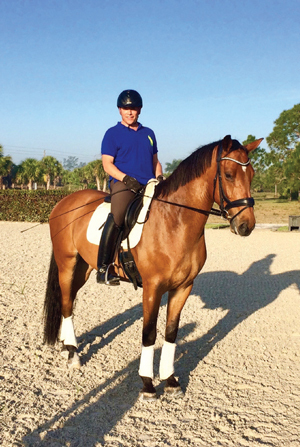 And Scott Durkin, Douglas Elliman’s chief operating officer, told TRD last month that he owns five horses — a Friesian and four Warmbloods — which he keeps at a stable in the Hudson Valley. Well-bred Friesians can run in the tens of thousands of dollars apiece.